This is going to be a little self-indulgent. Okay, more than a little. But when you name a web site “geoffrodkey.com,” self-indulgence is kind of baked into the cake. So, you know. While obsessively googling references to Deadweather and Sunrise, I came across a review from Italian blogger Daniele Imperi. He read the English edition, but wrote his review in Italian. Unfortunately, I don’t speak Italian. But Google Translate does! Sort of. As I discovered when it translated the Spanish edition’s rendering of Deadweather Island, la isla de Bochorno, as “Embarrassment Island”–and as my kids seem unable to accept no matter how disastrously it fails them whenever they try to cheat on their French homework–Google Translate is an imperfect tool. “Deadweather Sunrise and thus appears to us to be a part of an imaginary universe, imaginative, the other a real place, tangible, that exists somewhere in the ocean, more or less where raging pirate ships. “Deadweather and Sunrise immediately captures the reader from the opening lines, revealing sometimes adventurous, sometimes hilarious, sometimes dramatic. A mixture of feelings that live together in a wonderfully original story environment pirate who can renew the genre. “Mix Treasure Island with The Adventures of Tom Sawyer, softened tones in both and throw them in the island that does not exist, even in the islands that are not there, and you Deadweather and Sunrise. in that it’s funny, and exciting, and marketed to 10-year-olds but a good read even if you haven’t been that age since Ronald Reagan was president. The Next Big Thing is a sort of literary chain letter, passed from author to author, and designed to get us to talk about not only our next project, but the projects we’re excited about seeing from three other authors. 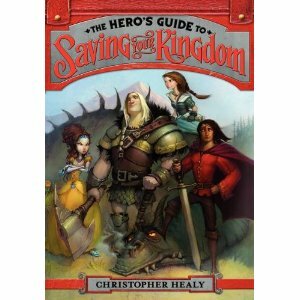 Christopher Healy, whose A Hero’s Guide to Saving Your Kingdom also has a lot in common with Deadweather and Sunrise: it’s a funny adventure, the first in a trilogy, was released in May 2012, and was named one of Amazon’s Best Middle Grade Books of 2012. A Hero’s Guide… is the story of four Princes Charming–the unnamed love interests in Cinderella, Sleeping Beauty, Snow White, and Rapunzel–who wind up getting in a whole lot of trouble involving a witch and the aforementioned princesses, one of whom is a real piece of work. It’s a lot of fun, and I’m looking forward to hearing more about the second book in the series. Tommy Greenwald, author of Charlie Joe Jackson’s Guide to Not Reading and Charlie Joe Jackson’s Guide to Extra Credit. Charlie Joe is a middle schooler who’s much cooler than I was at that age, and who–just like my own kids–goes to sometimes extraordinary lengths to avoid reading.I read both of these books out loud to my 10- and 7-year-old boys, and all three of us had a fantastic time with them. In fact, my kids are more excited about the next Charlie Joe Jackson book than they are about the next Chronicles of Egg book. I don’t blame Tommy for that; I blame my parenting. Amy Ignatow is the author-illustrator of The Popularity Papers series, which follows the continuing adventures of fifth graders Lydia Goldblatt and Julie Graham-Chang. I think these books are hilarious, although I can’t get my sons to read them for the same reason my wife couldn’t get me to read the Twilight series–they are ever so slightly gender-specific in their appeal. But if you have a daughter, and she hasn’t checked out this series yet, she will love it. I’m secretly hoping Amy’s planning to announce a brand-new series that’s more boy-centric (I think she could really make hay with gratuitous violence and fart jokes), but I’m pretty sure her Next Big Thing is a continuation of the Lydia and Julie saga, not least because it’s been a big hit. NEW LANDS isn’t just the working title in the second volume in the Chronicles of Egg series–it’s the actual title! And it comes out on May 2nd. The action picks up where Deadweather and Sunrise left off–with Egg and Guts en route to the New Lands in search of the lost Okalu tribe, who hold the key to the mysterious treasure map that Egg can’t decipher. But the ruthless Roger Pembroke is hard on Egg’s trail, the New Lands are full of new enemies, and our heroes’ only weapons are their brains, their courage, and the two dozen Cartager swear words that Guts picks up from a foul-mouthed sailor in Chapter 1. They’re going to need help. But who can they trust? Is Kira, the beautiful and heavily armed Okalu refugee, their ally…or their enemy? Is Pembroke’s daughter Millicent on Egg’s side…or her father’s? Why on earth is the notorious pirate Burn Healy being so NICE to them? And the biggest question of all: what shocking secret will Egg discover in the shadow of an ancient Okalu temple? I vaguely recall Stephen King once writing that when people ask him where his ideas come from, his standard answer is “Mars” — because the truth is that he doesn’t know where they come from. They just sort of show up. New Lands is like that. The story grew out of what happened in Deadweather and Sunrise, except that the stakes have gotten bigger, the canvas has gotten wider (moving from a handful of islands to an entire continent), and a lot of the questions left tantalizingly hanging in book 1 will finally be answered. Although some of those answers will only lead to bigger questions. But all of THOSE questions will be answered, once and for all, in book 3. I promise. It’s sort of a fantasy, except that there’s nothing fantastical about the world. It’s sort of historical, except that the history is all made up. It’s sort of middle grade, except that I tried to write it so adults could enjoy it as much as kids. I think “adventure-comedy” is a pretty fair description. I started working on this trilogy because I was tired of writing movies, so that’s something I’d rather leave to other people. It’s published by Putnam/Penguin, and represented by the very talented Josh Getzler of Hannigan Salky Getzler. Six months. Plus six months of thinking about it before I started. Plus the six months that it took to write Deadweather and Sunrise before that. Plus the two years I spent thinking about the whole trilogy before I started writing any of them. Someone (okay, not someone–my agent) described Deadweather as “The Princess Bride with 13-year-olds,” which I think is very accurate. There are also some tonal similarities to both the Percy Jackson and Artemis Fowl books. I wanted to write something that was as much fun as you can possibly have between two covers. Not to put too fine a point on it, but it’s the finest book written in English for a middle grade audience since…well, I guess that’s a tie between A Hero’s Guide to Saving Your Kingdom, Charlie Joe Jackson’s Guide to Extra Credit, and The Popularity Papers, Vol. 4.